I really like the taste of Tilapia and had some in the freezer from the big pack I bought last week. This was an easy, quick and delicious way to cook the fish and basically the same way I like my pork chops. I wonder if chicken would be good like this. I guess we will know next week! I paired this with frozen vegetables I got at Sprouts. It had a special oil and was all mixed together on the stovetop. Also, my favorite side – Just for One corn. Delicious. In a small bowl, beat egg with small amount of water. In a separate dish, combine breadcrumbs and Parmesan. Dip fish one at a time in egg mixture and then in cheese mixture and coat evenly. Spray baking sheet with Pam spray and place fish on baking sheet. 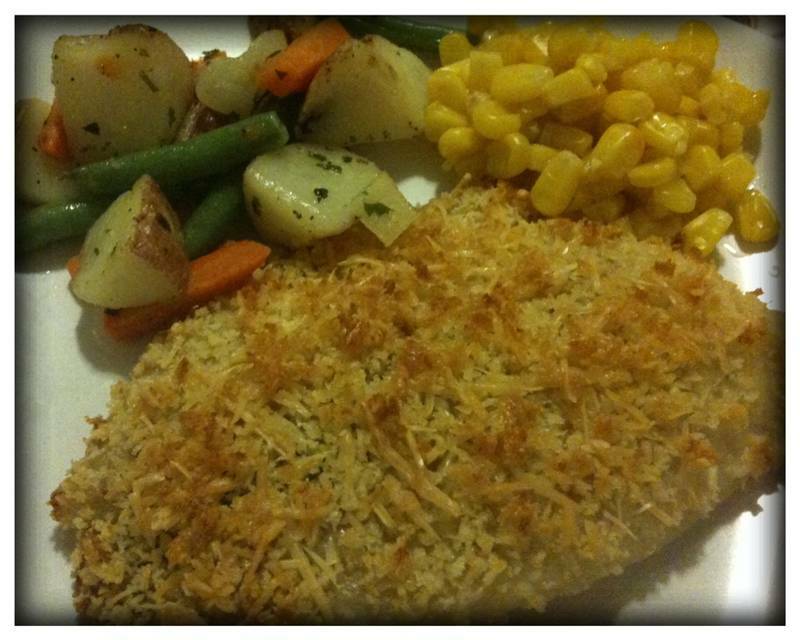 You can add more of the breadcrumb/cheese mixture to the top of the fish to make it crispier. Spray tops of fish lightly with Pam spray. Bake 20-25 minutes.